An undisputable fact based on science as we [humankind] understand it correctly, is that we all reside upon the big blue marble known as Earth. Also undisputable is the fact that if one were to remove all the clutter (ethnicity, race, color, creed, sexual preferences, and religious or political affiliations, one would validate that we are all people. Further, people are social beings, and have learned over the centuries of existence, that unified effort begets rewards of survival (not being eaten by carnivorous beasts). 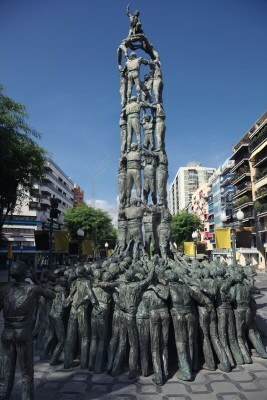 Castell in Tarragona, Spain: A castell is a human tower, which is built in two phases (a base and the tower). The similitude between the castell and organizations is amazing: both require willing people in order to be successful; both rely on strength and agility to grow; both must have a firm foundation for support; and absolutely essential is commitment and active participation from the people at the top. When people join together for a common purpose, whether for survival against threats to their existence, or to reach for higher aspirations, innovation becomes the achievable bi-product of the collective efforts. Innovation is why humans survived, and why dinosaurs and saber-tooth tigers became extinct. Perhaps then, by drawing on the analogy, a lack of innovation, brought about by a deficit or non-existent unity in purpose can be attributed to the demise of organizations, wherein the leaders focused more on short-term financial gains at the expense of long-term investments in the people? If the knowledge that unified effort ensures survival is universally accepted, and scientifically proven, then why is that organizational leaders and managers place so much emphasis on individual performance, against metrics which by design measure arbitrary objectives? I believe Simon Sinek has done an excellent job explaining why, we should begin with asking why? Please watch this video. Please let me know your thoughts on the video, but more importantly, I would like to know your thoughts on the investment in people vs. metric [chart] chasing. Thanks for reading. This entry was posted in Education, Leadership and tagged 2bfree4life, breaking the chains, Business, caring, Change, Courage, Education, Emotional Contagion, Emotional Intelligence, Follower, Followership, greatness, Leader, Leadership, Management, Managing, Maslow, moral compass, Ripple Effect, Servant Leader, social connectedness, trust. Bookmark the permalink. Great speech! Couldn’t agree more with Simon on this topic. Great post Bobby! This video is incredible! This guy gets it! And not only that, because he gets it, everyone he comes in contact with, benefits and all have been edified,, and your post comes into focus.